If you want to commit your money to a term deposit but you’re not quite ready to lock it away for the next few years, then a short term deposit might just be the solution you’re looking for. It's still low-risk and a stable way of earning a return on your savings, but without the commitment of not touching your funds for years on end. Check out the details below to decide if a short term deposit is for you. How short is a ‘short’ term deposit? Term deposits can last for as little as 1 month, and usually go up in increments of a month or two at a time. Common terms for shorter periods include 1, 3, 4, 6, and 12 months. Some terms will also have a rollover option so you can easily extend the period if you want to. Which term you choose will depend on your saving goals and style. The important thing is to choose a term that will stop you from making premature withdrawals. It’s not as big a commitment as a long term deposit. If you’re worried you might need those funds at some point in the future, you might feel comfortable locking them away for just a short term. Saving for a holiday in six months, or to buy a new car in three? By stashing your money in a term deposit for that time, you’ll be much less likely to spend it, and meeting short term savings goals will be a breeze. There’s less chance of getting stuck paying early withdrawal fees. If something unexpected happens, it will be much easier to wait out a short term and avoid early withdrawal fees than it would be with a ten year term. When the short term ends, you’ll have the chance to add more money to your term deposit balance and then reinvest for another term. This boost will have you earning even more interest - as long as you secure the same or a better interest rate. If market interest rates rise, you won’t spend years stuck with a low rate term deposit, kicking yourself for locking in at the wrong time. Generally speaking, shorter terms often come with a lower interest rate attached. A short term means that you’ll have the chance to spend the money sooner. This might not be a good thing if you’re saving for a long term goal! It’s not as low maintenance. If you choose a shorter term, the decision of what to do with your money once your term deposit matures will roll around much sooner. If you are planning to let your short term deposit rollover, you may lose your competitive interest rate if market conditions have changed. Who is a short term deposit good for? Savers who might need access to the money in the future. If there’s a chance you’ll need to get your hands on those funds in a month, 3 months or 6 months time, a short term deposit might be a good alternative to a long term deposit deal. Another option for easy access is a savings account. Those who need a quick boost to short term savings. If you’ve got a holiday coming up in 3 months and would like a little extra spending money, you could put your stash away in a term deposit until then. The interest you earn will be a nice bonus that might buy you a couple of extra poolside cocktails! Savers who like to spend too much. 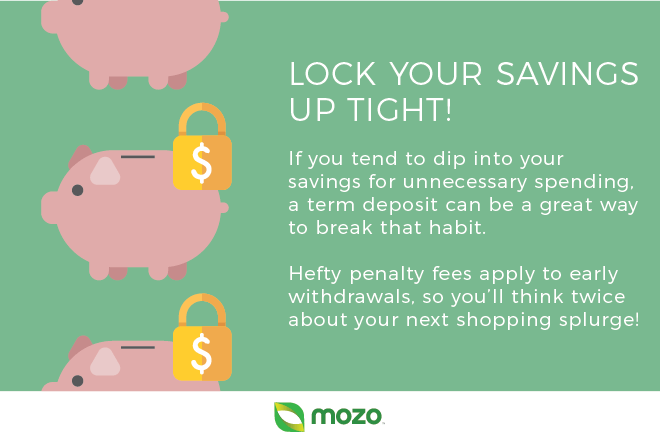 If you have a short term savings goal but tend to spend money you have access to, a short term deposit - with hefty fees for early withdrawals - could be just the thing to help you keep your hands off your stash. When does a short term deposit pay interest? Usually, your short term deposit, up to 12 months, will pay interest at the end of the term, which is called ‘at maturity’. Some term deposit offers come with the option of monthly interest payments, but these aren’t very common. Maximise your balance. Generally speaking, the bigger your balance, the more interest you’ll earn. So scrounge up your pennies, and deposit any dollars you’re not likely to need for the length of your chosen term. Keep an emergency fund. The number one rule with any term deposit is to try not to withdraw early. If you do you’ll pay hefty penalties, so it’s a good idea to have a separate emergency fund for unexpected events. Shop around. Short term deposits don’t always offer the best interest rates so make sure you snag the best one possible before going ahead. Try opting for a short term deposit with a rollover option. That means that at the end of each short term, you’ll have the chance to withdraw funds you need or deposit extra money, and then reinvest for another term. Just remember that the interest rate being offered on the rollover term may not be the best one - so make sure you compare term deposit deals again before committing. Long term deposit. This might be a good option if you decide you can do without the funds for longer, if you want a zero fuss way to grow your savings pile, or if you’re saving for a long term goal, like retirement. Savings account. Opt for a savings account if you want to have easier access to your funds. The good news is you can find plenty of great savings account deals that have bonus interest rates as good or better than a term deposit. Hint: make sure you can meet all the criteria to score bonus interest each month to make the most of your savings account. Investing in shares. If you want to supersize the return you get on your savings, investing in shares may be a good way to do it. Just remember, this approach is much riskier and takes a lot more dedication and know-how than a term deposit. To get started, visit our investment hub. If you’ve decided a term deposit is for you, then there’s no time like the present to get started! Make your first stop our term deposit comparison page, where you can take a look at the different offers available in the market. If you want to narrow it down a little, take our term deposit comparison tool for a whirl, and put in your deposit amount, investment term and location to get personalised results. Then, before you commit, head over to our customer review section to see how other Aussie savers rate their term deposits!